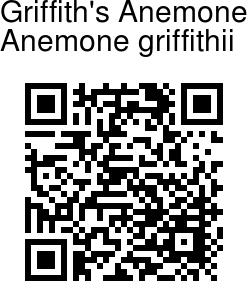 Griffith's Anemone is a perennial herb characterized by a single flower carried on a long upright leafless stem, with typically more than 5 petals (technically sepals). Flowering stem is solitary, 5-20 cm, sparsely finely velvet-hairy towards the top, 1- or 2-flowered. Flower-stalk is 2-7 cm, densely finely velvet-hairy. Sepals are 5 or more, white, pinkish, or mauve, obovate-oblong, 6-10 x 4-6 mm, nearly hairless or sparsely finely velvet-hairy, basal veins 3-5. Stamens are 3-6 mm, filament thread-like; anther ellipsoid. Ovary is ovoid, compressed, ribbed, nearly hairless; style nearly absent; stigma nearly spherical. Leaves are 3-6; leaf-stalk 5-8 cm, nearly hairless, base sheathing, surrounded by fibrous remnants; leaf blade ternate, rhombic, 2-4 x 3-4 cm, sparsely appressed finely velvet-hairy; leaflet-stalks 2--5 mm; central leaflet 3-lobed, rhombic or rhombic-ovate, base broadly wedge-shaped, margin pointedly sawtoothed or incised, tip pointed; lateral leaflets unequally 2-parted or 2-lobed, obliquely flabellate. Involucral bracts are 3; leaf-stalk 5-10 x 1-2 mm; bract blade ternate, similar to that of leaves but larger, 2-5 x 3-6 cm, sparsely finely velvet-hairy; leaflet-stalks 1--3 mm; central segment 3-lobed; lateral segments 2-lobed, smaller than central one. 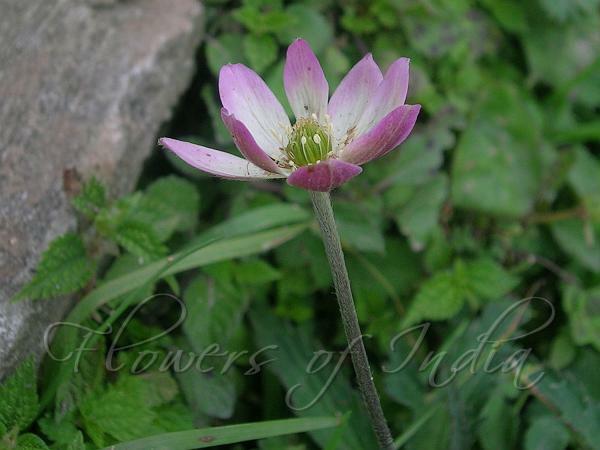 Griffith's Anemone is found in forests and streamsides, in the Himalayas, at altitudes of 1600-3000 m in Bhutan, Nepal, Sikkim, Arunachal Pradesh and parts of China. Flowering: May-June.